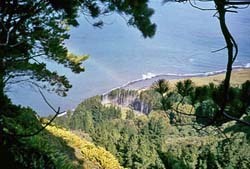 Sandy Point on the east coast is the site of Tristan's orchard and pine plantation. Sandy Point is situated on Tristan's east coast. 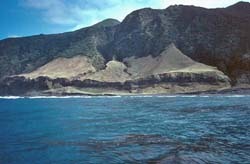 A relatively wide black sand beach is fringed by low cliffs and a narrow sloping shelf extends up to the lowest of Tristan's fringing cliffs (as the east is less exposed to sea erosion). Here a farm was set up in the 1950s, and though attempts to grow vegetables were abandoned, the pine plantation and fruit trees of apple and plum make this area unique. 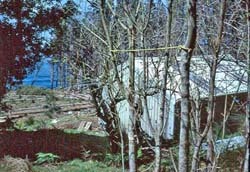 In the 1980s the Sandy Point Hut was rebuilt and men from the Agriculture Department would be based here to fell, trim and transport the mature pines onto barges for use around the Settlement, particularly for fencing and use in making camping huts at the Patches or Nightingale. 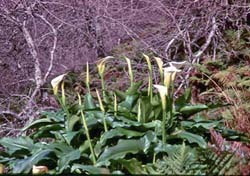 Arum Lilies flourish amongst the Sandy Point Apple Orchard in the winter sun. Sandy Point is a lot warmer and drier than the Settlement. Sandy Point from the sea - a soft landing! The grassy slopes above the low cliffs, are grazed by sheep. It was at Sandy Point in 1882 that the US Schooner Henry B Paul was apparently deliberately wrecked on the sand beach and black rats came ashore to cause havoc amongst the smaller land and seabirds as well as islanders' crops.